Police are urging parents to check their children’s phones in an effort to keep them safe online. We are also urging parents to stay up-to-date with the latest online trends, in an effort to increase awareness of cyber safety. April Requard uncovers ten apps that police believe should be “off-limits” to children. Below is a run-down of the ten apps. Omegle is a free online chat room that lets users talk anonymously to complete strangers. Omegle, which was launched in 2009, randomly pairs users in one-on-one chat sessions where they can chat to people all around the world. The site now provides a mobile app that lets users chat with strangers from mobile devices. 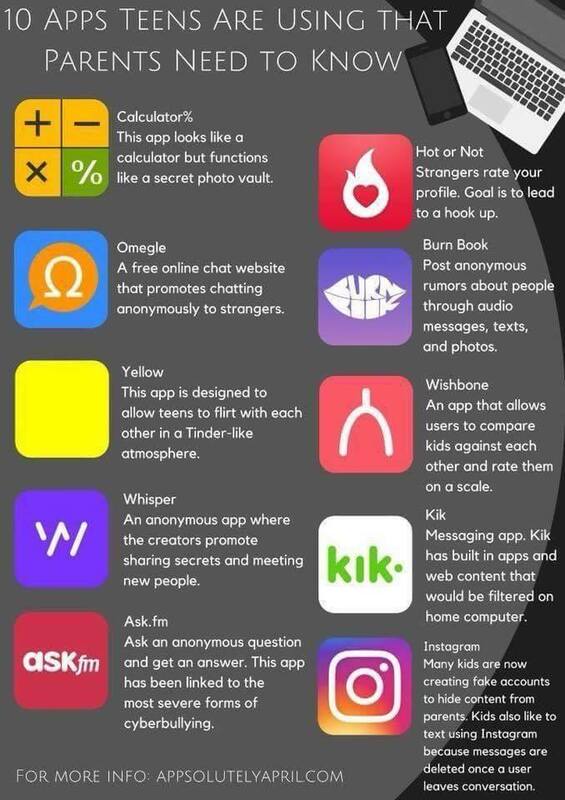 This app has had quite a lot press in the past for its similarity to adult dating apps – and it’s been criticised for letting young users exchange texts and photos with nearby strangers. Users are also able to “swipe” other users that they are interested in and swap selfies with each other. Requard explained: “This app is designed to allow teens to flirt with each other in a Tinder-like atmosphere.” The app has been criticised due to concerns that the photo-based dating app could be used to trade naked pictures. This allows users to hide private photos and videos in plain sight by disguising itself as a humble calculator. It also allows users to write and store private notes and securely browse the internet with a private browser. Requard explained: “This app might look like a calculator but it actually functions as a secret photo vault.” Other apps with similar settings include Secret Calculator Vault and Calculator + Photo Lock Vault. Ask.fm is a social networking site where users create profiles and send each other anonymous questions. Requard claimed that the app had been “linked to the most severe forms of cyberbullying” as it allows users to send cruel questions and messages completely anonymously. The site, which was launched in 2010, came under fire following the deaths of two English teenagers who killed themselves after they were bullied on the site. Kik is a free instant messaging mobile app that allows users to send and receive messages, photos, videos and mobile web pages. You can also join special groups and video chat using the app. Requard said: “Kik has in built apps and web content that would be filtered on the home computer.” Kik is known for its features preserving users’ anonymity, such as allowing users to register without providing a telephone number. Burnbook is an anonymous gossip app that lets users post rumours about people through audio, messages, texts and photos. Named after the “burn book” in teen movie Mean Girls, users can download the app for free, search for school “communities” within 10 miles, and share text, photo, and audio messages with other community members. It is worth noting that this app may have been removed from iTunes and Google Play following complaints. Requard describes Whisper as an “anonymous app where the creators promote sharing secrets and meeting new people”. The service allows users to post and share private photo and video messages completely anonymously. The posts, known as “whispers”, consist of text superimposed over an image – which can be uploaded or selected from an in-app search engine. The app was launched in 2012 and now has 250 million monthly users across 187 countries. Probably the best-known app on the list, Instagram is a photo and video-sharing social networking service that is owned by Facebook. Requard’s concern is that users can have more than one account. She explained: “Many social media platforms allow for more than one user account.